This highly unusual retablo incorporates many of the symbolic imagery of the Immaculate Conception. As seen in the Immaculate Conception, the Virgin is standing on a crescent moon, dressed in a white gown held together at the waistline by a golden tassel cord and enveloped in a blue mantle and is crowned. She also is wearing earrings and a necklace. The major difference in this piece from the Immaculate Conception is that Mary is holding the Christ child. 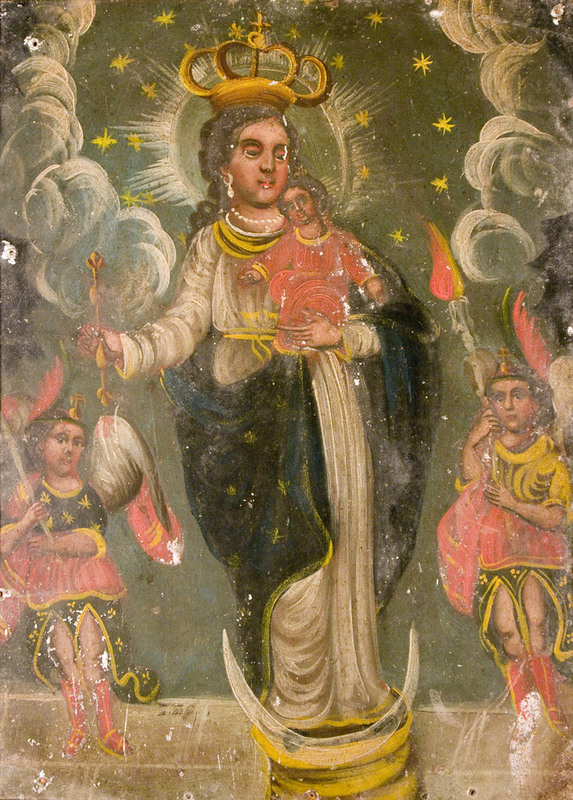 She also is holding a scepter in right hand indicating her royal status and is flanked by archangels. This may have been a flourish on the part of the artist to add interest to the piece. Also, the artist has placed below the crescent moon, a pedestal instead of the Earth or the serpent with the apple in its mouth. It is possible that the artist was copying a statue rather than a painting of the Virgin and included the stand in this retablo. It is also interesting to note that both the Virgin and Christ child skin tones are darker and their features less European and more Mexican.